Happy beginning of Advent everyone! We had some really beautiful weather over the weekend, so it doesn't really feel like it can possibly be December - but I'm not complaining - LOVE warmer, sunnier days. Instead of a chocolate or picture advent calendar, this year I have a "tea" advent calendar. So it's a different herbal tea for every day until christmas. Been so excited about it, but the first tea was absolutely disgusting - like drinking a cup of lavender - hoping it'll pick up it's game, but I think it's going to be a bit russian roulette every morning! Kia is not sharing my first of December excitement & has decided to have a duvet day. So on with today's recipe. Bit frustrated because these supercute cup cakes looked so good (if I do say so myself) and I didn't manage to get a pic to do them justice. I need a new camera.......or some photography lessons.......or both. it should make about 8 cupcakes. 125g icing sugar. 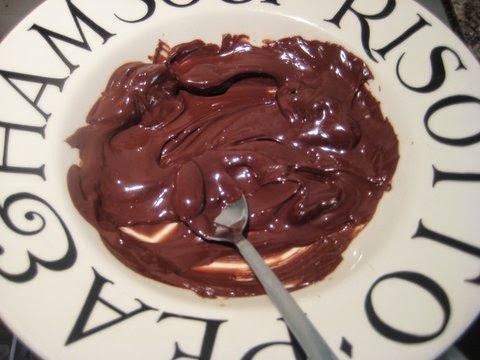 2 tablespoons cocoa, 2 1/2 tablespoons warm water. chocolate decorating icing for the centre of the eyes. 100g dark chocolate for the antlers. 1. Beat all the cake ingredients together (either by hand or in a blender). until you get a nice smooth cake batter. place the cherries and white choc buttons in shape for the eyes and nose. using chocolate decorating icing make some little black dots for the eyes. melt the chocolate. I brought a pan of water to the boil, then reduced the heat to a simmer. broke the chocolate up into chunks, and put it in a bowl on top of the saucepan until the chocolate melted. 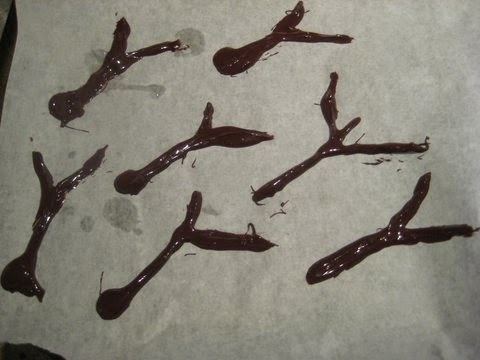 take a sheet of baking paper and lay it on a baking tray (so that its easy to lift the tray and place in the fridge), and using a spoon, make some "antler shapes". Not too thin or they will snap easily. you will need 16 antlers for 8 reindeers, but make more than that in case any do snap, also then you can pick the best ones. I know they look a bit messy, but they looked fine once on the cupcakes, so don't worry about being too artistic. place the sheet of baking paper in the fridge until they set.